Who have you used in the KC metro to engrave an SBR lower. I heard some rumors about a laser engraver here, but have yet to locate them. Any help is as always appreciated. I have not personally used him yet, but have seen his SBR markings in person and he is top notch!!! And for the record, SBR markings must include your name, city and state, or "recognized" abbreviations such as KC MO for Kansas City Missouri or OP KS for Overland Park Kansas. They must also be at least 1/16" tall and .003" deep. That's pretty darn small. And the markings must be "conspicuous", meaning that you can't hide them under a removeable stock or pistol grip. They must be easily visible without requiring any disassembly of the firearm. There's no height requirement for the name and address, only a depth requirement of 0.003"
I am sorry but you are incorrect, Boomfab. "Sec. 479.102 How must firearms be identified? You, as the one who chops the barrel, removes the fake flash hider, puts the 11.5" upper on your AR15 are considered the "manufacturer" of the NFA firearm. Therefore you are indeed required to mark the weapon in accordance with the above quoted regulations including the minimum 1/16" letter height. And since you are re-using the original serial number, you are not required to assign a new one to the weapon. However, if you are manufacturing a brand new weapon, such as building a full-auto AK47 from a flat, then you would also be required to imprint the weapon with a unique serial number, caliber, etc. Title 27 of the CFR online, 479.102. The serial number has the height requirement. Manufacturer name and address requirements are elsewhere. Whoops, I missed that. Sorry. However if there is no minimum size requirement, then why aren't folks, and they aren't, using micro-engraving for their name and address on SBRs? There was a proposal in 1999 to require everything to be at least 3/32" tall and .005" deep but that was narrowly defeated. The depth requirement makes one use readable size letters in a round about way. Thanks guys, I'm close to Lee's Summit so that works. Let God sort 'em out... WOLVERINES! 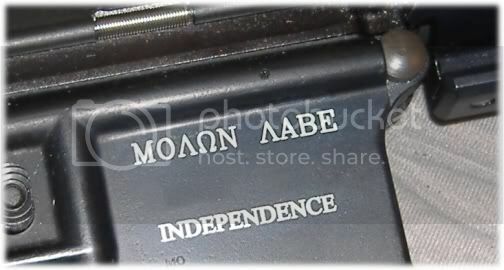 I used Shawn to engrave an SBR lower for my wife's AR. He's a straight up guy and I'll be doing business with him again (hopefully soon). With your sights on center chest, twice your trigger you have pressed. If those two fail to stop the fight, a shot to the head will set things right! I think most of you have seen this pic before. Shawn in Lees Summit did it. btw he was doing some work for Barrett, but I'm not sure if he still does. He showed me some of their recievers that he had finished. "When chance meets the prepared mind!" Went down to see Shawn. You are right, this guy is the best. Quick, professional and VERY reasonable. I hoghly recommend him to anyone else looking. Thanks guys! What is the avarage cost for a little custom 1inch x 1inch designein the mag well, anybody know??? Just give Shawn a call, he is a super guy and would be able to tell you easily. I found him through DBAR and couldn't have asked for an easier guy to deal with. He charged me $20 for my SBR engraving BTW. He has alot of samples of things he can do on differant surfaces. I actually spent more time talking to him and checking out his work than it took him to do my engraving. I've since sent 3 others his way and everyone has had the same opinion of both he and his work. Shawn charged me $20 for the engraving on my wife's SBR that I built for her. The gun started as a $550 CMMG "garbage can sale" used CAR-15 type. I never even test fired it before yanking it apart and having Jkj1911 chop the barrel for me. With the engraving cost this is the best $570 AR ever! Of course when I take it off MCA's books one day and transfer it to myself I'll have to pay $200 more, but even at $770 why the hell not? She really likes it, overall weight is very light and it balances nicely with the 11.5 HBAR. I took some other rifles off the rack so I could turn the "his n hers" ARs sideways for a quick pic. They go together nicely I think. Adds a whole new meaning to the phrase "drop the hammer"......Then again maybe it just clarifies the meaning!!! Anyway, the engraving looks good and so does the rifle. I thought of it because of her style of shooting. She isn't much on "fire discipline," she's more of a suppressing fire type. Give her a full mag and she'll give you an empty mag in return, in short order! Saturation fire of an area target….I like it. Sorry guys, I'm not dodging posting pics, I just can't find my damn camera. Here are the pics. Shawn rocks, don't hesitate! "Saint Michael the Archangel defend us in Battle." Am I right? My latin is rusty since I finished law school. EDIT: Nice setup, what is that a 7 inch? Would look even more badass with a quad rail and forward pistol grip, if that's your style. That would be correct, on the latin and the barrel. The five crosses are from the flag that was flown in the holy land when the crusaders ran out the "moslems" as they were known. Thought about a rail, but I grip the magwell anyway, so I passed. power of God thrust into hell Satan and all the evil spirits who prowl about the world for the ruin of souls.